A graphene lightbulb with a longer lifetime, cheaper manufacturing costs, and lower energy emissions has been launched by Graphene Lighting PLC, a spin-out based on a partnership between the University of Manchester and the National Graphene Institute. The partnership was set up to create new applications for graphene, which is 200 times stronger than steel. Graphene Lighting PLC will produce the innovative dimmable lightbulb, which scientists say has a slightly superior performance and longer lifetime than traditional LED bulbs. It has a filament-shaped LED coated in graphene. The company says the graphene in the light bulb conducts electricity and heat much more effectively, making it superior to anything else available when it comes to market. The University of Manchester has a shareholding in Graphene Lighting PLC, which was incorporated on August 29th, 2014. The University says it wants to make sure it benefits from the commercial applications created by the National Graphene Institute (NGI). Gaphene, consisting of a single layer of pure carbons arranged in a hexagonal lattice pattern, was isolated in 2004 at the University of Manchester by two Russian-born scientists – Andre Geim and Kostya Novoselov. They were both knighted (became ‘Sir’), and in 2010 earned the Nobel Prize for Physics. The University of Manchester is the ‘home of graphene’, with more than 200 scientists and an unrivalled breadth of 2D material and graphene research projects. The NGI, which is currently working with 35 companies from across the globe, will see commercial and academic partners working alongside each other on graphene applications of the future. The University says it will open the GEIC (Graphene Engineering Innovation Centre) in 2017, which will speed up the process of bringing new products to market. Graphene is just one-atom thick. NGI researchers say the potential uses for one-atom thick graphene are huge. They expect to create a wide range of products for the electronics industry. The scientists say that thanks to graphene, semi-transparent, flexible electronic will soon cease to be just a science fiction idea. According to the University of Manchester, NGI’s 1,500 square metres of clean room space is the largest academic area of its kind in the world dedicated purely to graphene research. 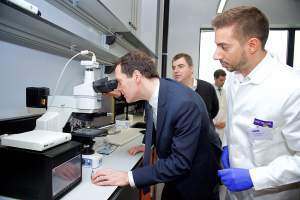 The National Graphene Institute was officially opened by the Chancellor of the Exchequer George Osborne on March 20th, where he was given a tour of the state-of-the-art cleanrooms and laboratories by Prof. Sir Kostya Novoselov. Funding for the £61 million facility came from the UK’s Engineering and Physical Sciences Research Council (£38 million) and the European Regional Development Fund (£23 million). The five-storey, 7,825 square metre facility features cutting-edge equipment throughout, making it the leading graphene research hub globally.